Despite being in existence for seven years, Charm City Cyclocross went out and did a couple things it never had before. One on purpose, and one predetermined by nature. For the first time, it actually rained a little bit on race day at Baltimore’s Druid Hill Park. Not a nasty drenching rain that leaves you cold, shaky and trying to believe that “this is what cyclocross is supposed to be like,” but a cool drizzle that turned an already technical Saturday course into one fraught with serious slippage. Little mud sections popped up and the thin mud was just the right consistency to get into the crevices of your tires and stay there until you hosed it out. 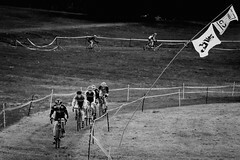 By the time the UCI race started, the rain had stopped and the course dried up a bit. It wouldn’t have mattered either way for these guys. They are just good at what they do. Amazingly fast on all features and riding the off-camber and technical sections as if Baltimore’s long dormant streetcars once traveled the same terrain [that was a metaphor for the way these cats scream through the turns like they are on rails; not sure it works, but it has some historic poetic flavor, so it’s staying in]. On Sunday, the second first occurred. [Can you have a second first? Can you have too much editorial interruption?] The traditional Charm City course was run in reverse. The prologue remained the same but then you did all those things you normally do at the end of the lap at the beginning. It didn’t make the natural barrier any lower, or the nasty little climbs any flatter, but it did set up to be a super fun course. Shot lots of video both days. Most of it is from Saturday, so that was a bit easier to compile. Sunday is still a work in progress. If an edit passes QC we will release that clip into the wild. Until that time, here’s what we put together from Saturday. And although it is Baltimore, and he was invited, Omar was a no show. This is my 2nd year racing Charm City, both years I’ve liked the 2nd day course better. Bill! This video is super duper great! Thanks!!!! I like the socks. Nice vid too! come on man, omar dead. kenard got him in the corner mart. everybody know that. you got to look out for mike now. A CHEESE STANDIGNK ALONES YUO DUMBYS!!!!!!!!!!!!!!!!! !